These days it’s easier to find media from the 30’s with mega furs than it is to find similarly well fashioned media from the 80’s. Despite what chronological order may suggest, even plumbing the depths of cable rarely turns up any 80’s gems. So we return to the by gone days of power furs and the women who knew who to use them. 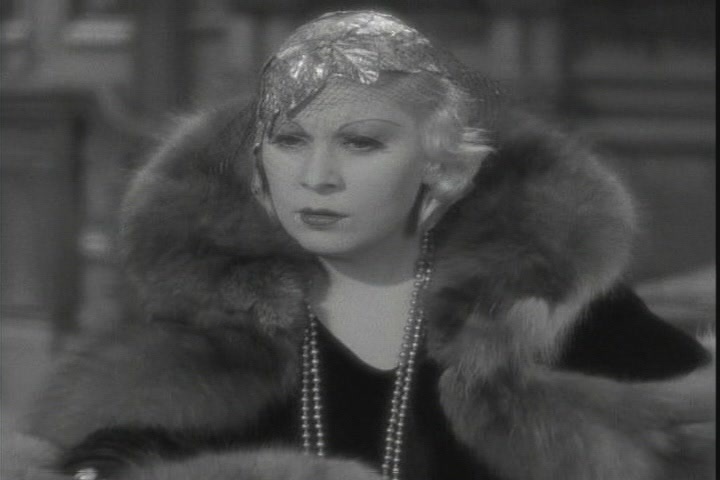 This time the woman in question is Mae West, who could pull off a power fox like few others. 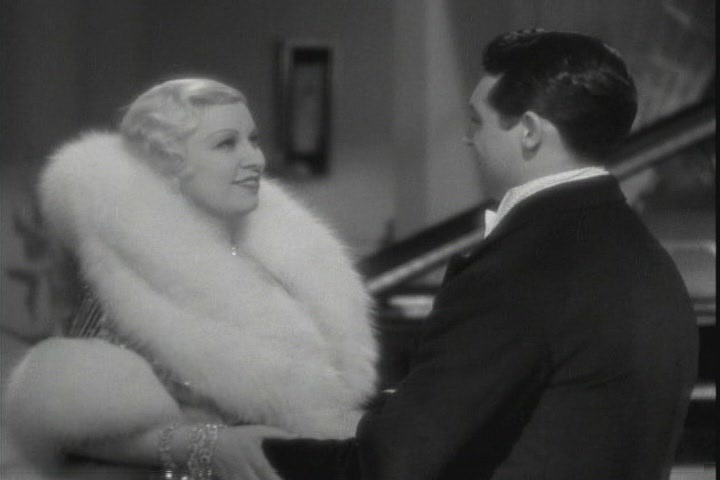 1933’s I’m No Angel is considered one of her classic roles. 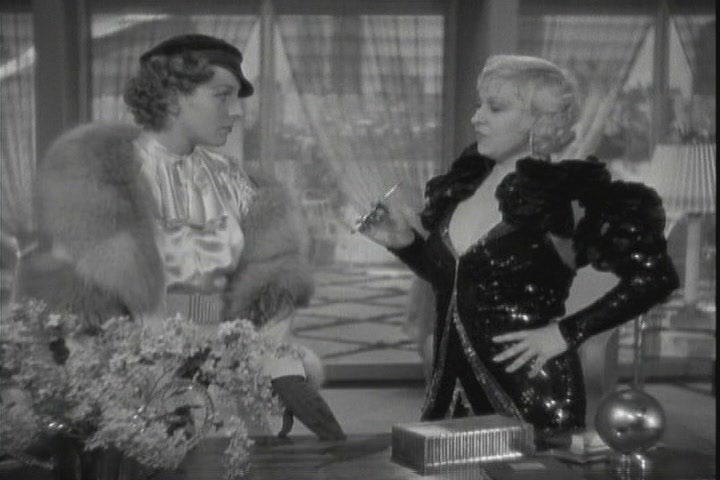 It serves up a couple very classic fox outfits in addition to a variety of classic Mae West lines. Tira arrives to the trial exceptionally well dressed, and ends up winning, both the trial, and her boyfriend back. The moral of the story is that all attractive women should wear fox to civil litigation. Tira first meets Jack’s cousin Kent when he and some friends visit her after an evening of lion taming. One of the friends sports this rather nice white fox collar. Kent’s fiancée doesn’t particularly care for Tira’s new found interest. She drops by to dissuade Tira from pursuing Kent. 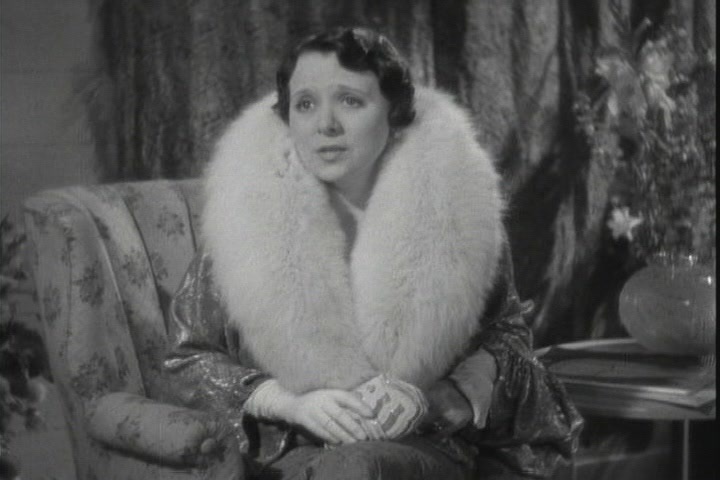 Gertrude Michael as Alicia Hutton wears the fox trimmed wrap in this scene, but Mae is in charge. The cigarette holder is a nice touch. The marquee fur is up next, this coat trimmed with enormous white fox collar and huge cuffs. Wisely we see it all when Miss West first enters, putting the entire coat on display. The combination collar / full fringe on the coat is perfect. Closer shot, highlighting the sheer size of the white fox collar on the coat. Fashion is fickle, but why did this ever go out of style? 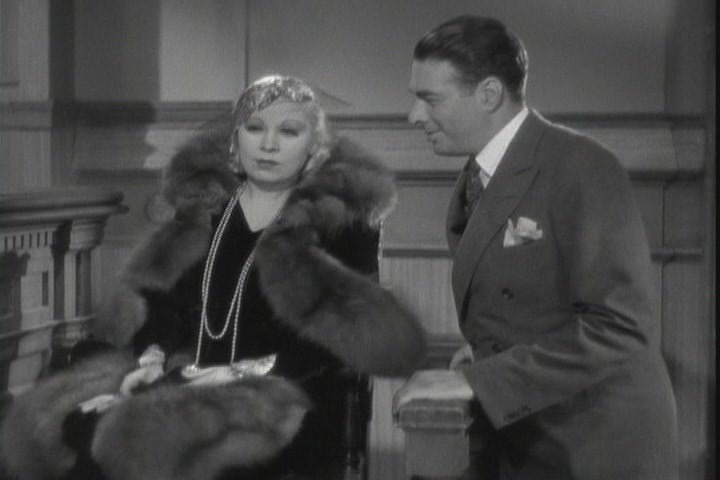 This shot is worth it just for Mae West’s expression alone. The white fox collar is the perfect frame. A brief interlude when Tira consults her lawyer before heading to trial against Jack. The silver fox muff and trim on the dress are just a prelude to the final act. Finally, in the penultimate sequence, the trial is on, and Tira takes over as her own counsel. She’s dressed the part in a cape with a huge fox collar and matching muff. The trail sequence lasts a good 10 minutes and she’s in this fur the entire time. Close up of the collar, because it’s definitely worth it. Victorious, Tira plays to the press, but realizes she loves Jack after all. Jack’s definitely the lucky one. Were I to gripe, I’d say that gold fabric on the the white fox was completely unnecessary. Were it all white fox, it would certainly be same league as Irene Dunne’s white fox from The Awful Truth. Still, the collar and cuffs were spectacular enough as they are. Enjoy: I’m No Angel Fur Gallery.